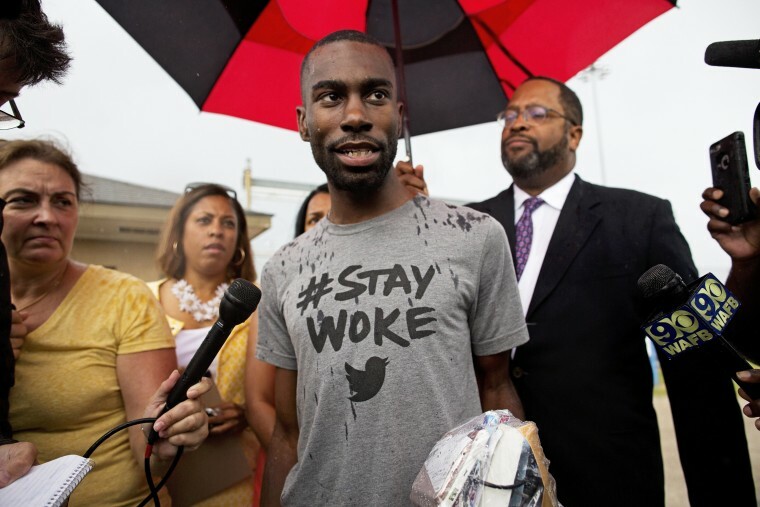 Black Lives Matter activist DeRay McKesson filed a class action lawsuit Thursday against the city of Baton Rouge, Louisiana, for alleged excessive use of force by police after he and more than 100 other protesters were arrested for “simple obstruction of highway commerce” last month. McKesson’s arrest on July 9 was captured on a live-stream on Periscope after he had been protesting the police shooting death of Alton Sterling. McKesson was released from the East Baton Rouge Parish jail the next day, and the obstruction charges against McKesson and the other 100 protesters were later dropped. The lawsuit said it will seek damages for civil rights violations for the "unlawful mass arrests" made by the city’s police without probable cause. Some of the people arrested for highway obstruction were apprehended on sidewalks, the grass and residents' homes, the suit added. "Defendants employed unconstitutional tactics to disturb, disrupt, infringe upon and criminalize plaintiffs and class members’ constitutional rights to freedom of speech and assembly," the suit stated. The suit specifically identifies the city of Baton Rouge, the East Baton Rouge Parish, the superintendent of the Louisiana State Police and the city’s local chief of police and sheriff as the defendants of the case. The police were also criticized in the suit for reacting in a “militarized and aggressive manner” to protesters, including threats to non-violent protesters who had guns pointed directly at them by officers. The suit claims that plaintiffs are entitled to compensation for lost wages, bond expenses, administrative fees paid to the city and jail, court costs, and past and future lawyer fees to clear records of their arrests. I met #AltonSterling's mother today too. We must hold the #BatonRouge police accountable. The ACLU and local activist groups also filed a lawsuit on July 13 against the Baton Rouge Police Department following the Alton Sterling protest arrests. The ACLU lawsuit claims “the police used excessive force, physical and verbal abuse and wrongful arrests to disperse protesters who were gathered peacefully to speak out against the police killing of Alton Sterling,” the organization said in a statement. Last week, a hearing for the ACLU case against local Baton Rouge police was postponed at the request of both parties in light of the violent ambush on Baton Rouge police officers on July 17, the Louisiana Record reported. State Police Col. Mike Edmonson, who hadn't seen the lawsuit, told the Associated Press he believes police "exercised great restraint" in response to the protests.